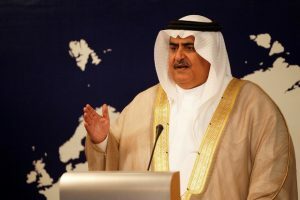 Bahrain’s Foreign Minister Sheikh Khalid bin Ahmed is currently on a visit to Iraq to boost ties between Manama and Baghdad as their relations have been tense following statements made by Iraqi officials after the conviction of several Bahraini citizens. The visiting Foreign Minister met separately with his Iraqi counterpart Ibrahim al-Jaafari, Prime Minister Haider al-Abadi and President Fuad Masoum. Baghdad has been fighting against the Islamic State group over the past three years while Manama claims that terrorist cells supported by Hezbollah and Tehran are threatening its security and stability. The two Foreign Ministers stressed the need to foster cooperation between the two countries primarily in security and intelligence to prevent the spread of terrorism. Regarding bilateral ties, he said Baghdad is keen to “enhance political, economic, trade and cultural relations” with Bahrain. Members of the Iraqi parliament foreign affairs committee noted that the visit will contribute to warming up the strained relations between Iraq and Bahrain. Written by: Jaber Ali on August 14, 2017.on August 15, 2017. Posted by Jaber Ali on Aug 14 2017. Filed under Gulf News, Headlines. You can follow any responses to this entry through the RSS 2.0. Both comments and pings are currently closed.